Much of what was presented by Sturaitis will be familiar to regular readers of this blog, but new and vital to those either new to PR or veterans of traditional PR only. As was the theme for much of this conference, and within the title of this session, the first step when drafting your next release will be to outline your measurement of success in advance, whether that be coverage, online visibility, straight up sales, disclosure, or some mixture of all or some of the above. Identify keywords for which you seek for your release to be found. Leverage keyword research to find popular keywords relating to your story or industry. Link these keywords back to your website. This will not only help increase keyword rankings for your site, but will provide another portal for users. Format your press release for robots and readers – place keywords up & to the left, where both of these lifeforms look. The reason for the vitality of Sturaitis’ tips came alive in Jarboe’s set where results driven case studies were shared. Symettricom, a developer of extremely niche technology chips, optimized a release around an admittedly unpopular, but extremely relevant keyword with a corresponding link to a form page. Predictably, only 8 inquiries were seen. Unpredictably, one of these leads accounted for $200 million. Christian Science Monitor, in support of their 11 part article on former hostage Jill Caroll, sought additional exposure through an optimized release. Jarboe, breaking AP style and (apparently, per his recollection the heart of the Monitor’s editor) identified Caroll as the keyword “Jill Caroll” several times throughout the release. The results were, again, a marked increase in traffic, simply by modifying AP style to “Google Style”. The biggest takeaway for PR professionals is the realization that little will change about what we do. Whether we are communicating via AP Style or “Google Style” we’re still communicating – and we’re still seeking to communicate with people. In other words, we don’t have to write like robots to be found by robots. If anything, the ROI seen with press releases thanks to our world’s advancements ensure we simply see more results for less as our messages retain far more permanence online. At the end of the day, more results for less work is something we could all become accustomed to, regardless of industry. Speaking of online PR and press release optimization, be sure to sign up now for the free Webinar on Wednesday Oct 29, 2pm EST. “SEO & PR: Using Online PR to Drive Better Search Results – Today PR generates more than just media visibility, it is a key tool to increase search engine rankings and drive website traffic. The webinar is free and you won’t be disappointed. Get more information here. Mike, thanks for the excellent piece on Press Release ROI, a cornerstone of what I refer to as “interactive PR.” It is amazing how many big brands are still clueless about optimized news releases — and part of it has to do with an old way of thinking: E.G. : you can’t make money DIRECTLY from a press release, right? WRONG! Your example citing Symettricom is classic. If you are really doing the SEO part of the job right, and someone obviously did take the time to do the research –It’s not always about driving tractor trailer loads of traffic. Sometimes you need to part the massive freeway cloverleafs of the information highway,and look underneath to find the private limos carrying a few precious passengers. And by providing the landing page, not just sending the prospects to a home page (which I still see all-too-often), Symettricom upped their chances of capturing that precious lead and gaining some control in the selling process. On two separate occasions, PR Newswire cited feature wire stories I wrote for clients in “best practices” seminars. Both were drive-to-web optimized releases and both were for ecommerce businesses that needed those features to deliver traffic and sales — which they did. And my clients did not have the benefit of a household brand name like Southwest Airlines or the Christian Science Monitor. The features both had a newsworthy twist — and that is my parting comment: you need both. A substantive well-written story, can only be further enhanced by thoughtful optimization techniques. As you said, robotspeak will not cut it. It’s exciting when both SEO technique, professional writing skills and PR strategy come together to produce something greater than the sum of its parts. Anyone who attended PRSA International and missed this session really missed out. 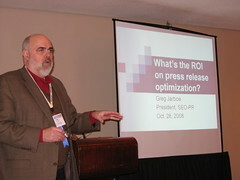 Greg Jarboe is a real pioneer in the field of press release optimization and bringing together SEO and PR.